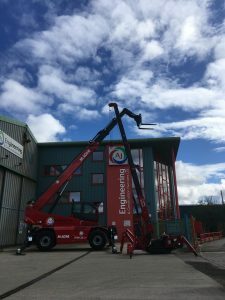 A SCOTTISH engineering and construction company has secured more work in the water sector thanks to an investment of two new pieces of lifting equipment. Forres-based firm AJ Engineering has purchased an all-terrain Magni rotating telescopic handler and a UNIC Spider Crane. The new machinery which arrived on site last week has assisted the company in securing further work in the water industry to the tune of £750,000 on sites across Moray and in Orkney. The Magni handler is capable of lifting 6T and has a lifting height of 30m whilst the UNIC Spider Crane which can fit through standard door openings, is capable of lifting 3T and has a lifting height of 9m. Both pieces of equipment were purchased with funding assistance from Highlands and Islands Enterprise.